Atmospheric Monthly Moisture Waves for the Full Atmosphere – or something else? | Watts Up With That? Atmospheric Monthly Moisture Waves for the Full Atmosphere – or something else? I’m sharing something which likely has been observed and perhaps even written widely about, yet I cannot find examples in the popular or peer review literature. These images are just a sample from the growing collection I’ve been compiling as time permits. These examples are limited for now to the monthly averaged values of EP for the full atmosphere. EP stands for “Evaporation minus Precipitation” in units of mm/day, as developed at the ERA Interim (ERAI) resources. This is nominally equivalent to atmospheric moisture, without accounting for the clouds. I’ve been working on a paper which in part compares this EP time series coverage since 1979 to solar cycles and continental streamflows. My paper is back in review and I thought I would take advantage of the break to continue to explore some of the many patterns of additional interest. 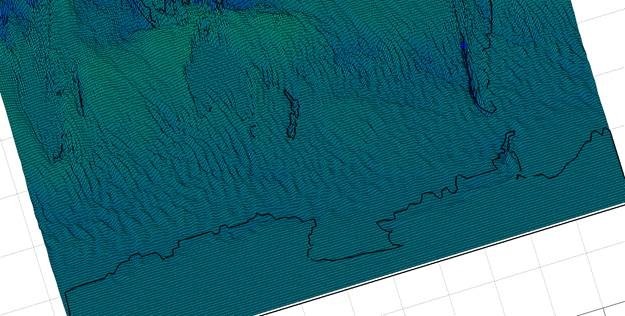 Earlier this year I had begun to notice some wave-like patterns in 2D contour plots of the EP. I thought they might be an artifact of some form of aliasing. Now that I’ve been plotting them via a Matlab surface plot option in the highest resolution available from the ERAI source (.703125 degrees per grid cell) I no longer believe that is the case. Figures 1 through 4 show these interesting wave-like patterns as averaged for the months of January and February from 1979 across most of the Northern Hemisphere (NH). Some ‘disclaimers’; I cannot yet program my Matlab application to consistently view and light these surfaces from the exact same camera location and so my manual application is why the views and hues vary somewhat for each screen capture. Also, I left some annotations in some of these images which are legacy of other work, such as the circles in the Western US. Since they are not germane to this discussion, I’m only noting that. Of the initial four images, the first two only cover the value of EP. In addition to applying a high resolution surface coverage, I also employed a Matlab “Winter” color scheme. Given the definition of EP, the more negative the value, the greater the relative amount of atmospheric moisture. In my implementation, the greater the moisture, the deeper and bluer the surface. One can confirm these surface plots are reasonable by examining regions where high moisture zones are well known to persist, such as the Pacific Northwest and the Equatorial Trough. In addition to those notable moisture concentrations, it would seem hard for anyone to miss the north – south trending ridges (I will call them megaripples) and troughs, thousands of kilometers long, which dominate the ocean footprints on either side of North America and which overlie that continent as well. With some notable exceptions such as the northeast coast of the US over January, the waves are not always expressed well within the lower moisture, higher pressure green zones which tend to dominate over summer months. Accordingly, to profile these waves, I’ve chosen to focus on a boreal winter season to start. A later image addresses the austral winter in the Southern Hemisphere, for the same reason. These appear to be real patterns of moisture and they happen to resemble more widely known gravity waves. But they are based on monthly averages. In contrast, the typical residence times of normal gravity waves are much less than a single day. Even so called “infra gravity” waves have periods shorter than a day. Also, gravity waves are often defined in association with the effects of orographic uplifts. Yet the megaripples can be found crossing the very flat Great Plains and Midwest of the U.S. So, perhaps they are not classic gravity waves. I explored some material at hand to see if they might be Rossby waves. At least Rossby waves are attributed to express much longer residence times than mere days. Rossby waves are defined in some sources as a Coriolis dominated type of inertial gravity wave in any case. Yet one would be challenged to find a graphic of a Rossby wave that resembled these megaripples in any way, shape or form. I am familiar with popular representations (including the Wikipedia page) of Rossby waves that appear to define them as the fluctuating curving boundaries of the Polar Vortex which is largely aligned with the North American Jet Stream. In other words, Rossby waves are popularly defined to primarily oscillate zonally and meridionally, not vertically. Accordingly, unless those popular definitions are inaccurate, then these EP features cannot be Rossby waves either. 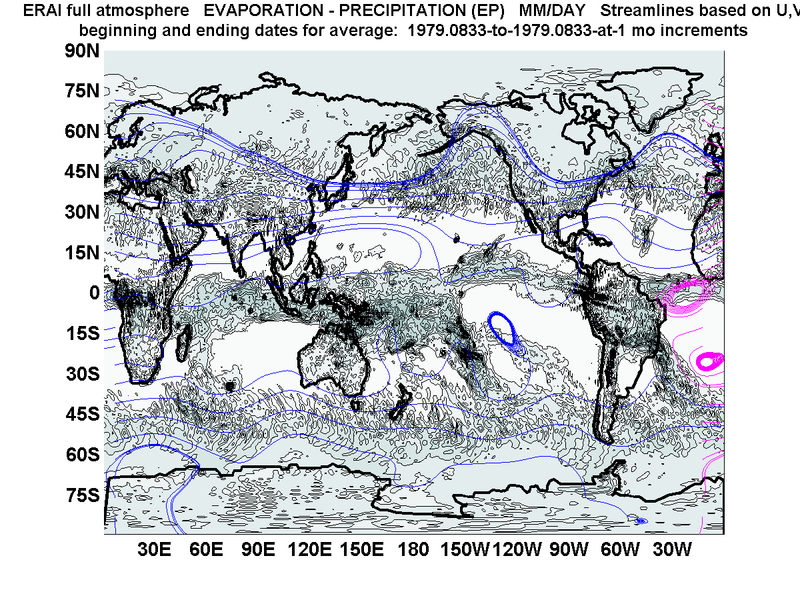 Rossby waves are also asserted to never migrate east. Given that, I hoped to track a single wave or two from month to month and determine if it moved east or west at all. Unfortunately, although many patterns and trends can be seen, there is not clear continuity of any individual wave form one month to the next, at least so far as I could tell. I decided to explore this in somewhat more detail by adding a set of streamlines in Figures 3 and 4 for the same EP surfaces. 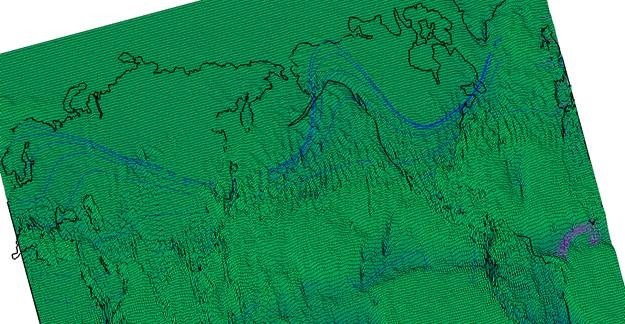 The blue streamlines originate near the left end of the global grid and the magenta streamlines originate near the right end. The default elevation for the streamlines is zero. Given the coincidental range for EP which extends slightly above and below zero, this leads to the appearance and disappearance of the streamlines according to the sign of the surface value. The streamlines for January 1979 near the Arctic do show the typical vortex pattern and accordingly, a Rossby wave near Alaska. Moreover, by the next month of February as expected, that wave has indeed migrated to the west and not east. But there doesn’t appear to be any clear correlation between that wave and the atmospheric ripples of my focus. One could note that the ripples appear to terminate where the vortex begins. There is at least that. But there are also the megaripples in the Southern Hemisphere as captured by Figure 5. The blue color scheme no doubt helps, but I think it is safe to say that these megaripples resemble nothing less than the typical waves of an ocean at closer view, or perhaps a transverse wind driven dune field. My best guess at this point is that these are composites of gravity waves. In this view, the many gravity waves over time over any area, when averaged over a month, simply yield these interesting patterns. . In any case, even if they are merely a composite artifact, they might be arguably “real” at a climatological, or at least a monthly scale. As I continue to read and research the lines of hydroclimatology most germane to my interests, I know that deeper and more analytical expressions of all planetary waves are surely in my academic future. But I’m not there yet and felt that sharing these observations is a way to also advance my learning. In other words, I don’t know what these waves are. Can anyone enlighten? As usual, many thanks to the Las Cruces Atmospheric Forum for their sounding board services. Michael’s blog is at www.abeqas.com. October 31, 2017 in Curious things. Have you considered/investigated that they are a “beat” type phenomenon, i.e. an artifact created in the imagery between transient waves in the atmosphere and the sampling rate of the imagery. Further to that rather cryptic comment, I am referring to the type of phenomenon that creates the image of wheels turning backwards in old western movies as the wheels of a wagon slowed down and the sampling rate of the film created a false image of a backward turning wheel or, for brief moments a stationary (non rotating) wheel. Thanks for “Aliasing.” I could not come up with that at 2:00 am. Bad night, only 3 hours sleep. If it is aliasing, it still means that a periodic or wave like structure are being observed and all that would be measured differently is the period/wavelength. 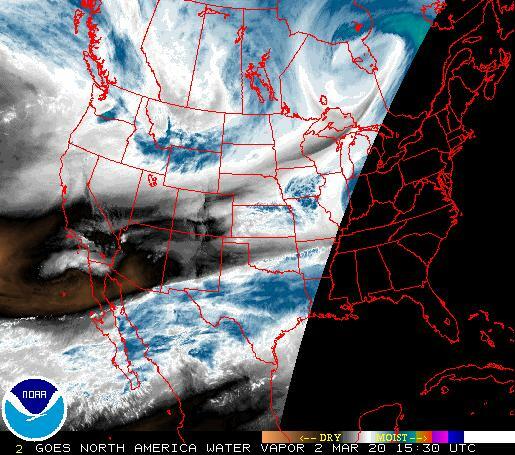 To me, this looks like the echoes of weather fronts. Yes it could be something like that. I’m leaning to this: The eastern margins of each continent typically express an associated temperature differential in comparison to the adjoining ocean surface. This leave an EP “track” or palimpsest every day (or more?) in the atmosphere. For the middle latitudes, when barotropic conditions more or less prevail, these tracks drift off to the east relatively intact. The rest of the moisture signatures appear consistent with other moisture observations. There are very likely several mechanisms whereby gravity interacts with the atmosphere including gravitational effects from the moon, Jupiter, etc. These things merit much more investigation as the contribution of gravity to both climate and weather seems to be poorly understood right now, it tends to get sidelined/ignored and yet we see huge effects of gravity here on earth every single day on things that are much more difficult to move about than thin wispy gases. Some of the gravity enthusiasts in atmospheric physics are derided as “cranks” . I suggest we refrain from this unscientific rudeness and actually get our brains in gear to TEST alternative theories/hypotheses via both experiments and observation. At the very least this will enable us to properly eliminate the true rubbish and might just further our current understanding. It’s a sort of proper scientific process, is it not? They are remarkable patterns. It’s hard to imagine a physical wave that would persist after monthly averaging. The spacing is not all that far from the grid spacing, so the numerics of representing on the grid could be a factor. But they seem much too interesting for that to be a reason. I’d worry a bit about putting streamlines into a month-averaged flow. There is no expectation that fluid is following those paths in any physical sense. And you can’t rely on a flow in a 2D section being divergence-free. Thanks and yes I agree. I only use streamlines with a great deal of caution and context. In this case I thought they might help get a sense of the Rossby wave motions, and that seems to be the case. They also give a sense of general patterns. Thank You. I sometimes use a coarser gridding of the same data but these “wrinkles” don’t appear then. 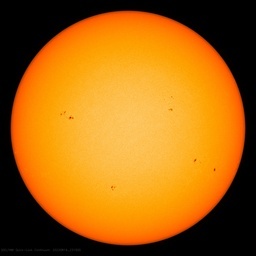 Which isn’t surprising since as you noted the spacing here is similar to the grid spacing..
would it possibly be from solar influence ie any time we have solar coronal holes belting earth are they more prominent? Thanks! I do find sometimes that auroras line up nicely with Antarctic full atmosphere circulation and it interests me, but that could also be coincidence. I guess that is still different than a solar coronal hole though. I suspect it is just an artifact of the spherical harmonics they use for gridding. Thanks, I’d be curious to learn more. I’m studying spherical harmonics in a class, so I will stay mindful and try to understand that option. Thank you for presenting your observation so clearly. thanks for reading this and your feedback. That goes for all responders. Ooh, you are awful, pstevens2 , but I like you. Would you care to offer something more…useful? Even at school, the profs would offer at least a hint as to specifics. I think that most likely nails it. For moire you need two frequencies. Grid could be one, but what is the other? A useful test would be to see if the pattern changes with different grid spacing. I would expect you could get a monthly beat from the lunar cycle into the atm. And it is the largest gravity pulse into earth and it move the mass of the atm around. Rossby waves are defined in some sources as a Coriolis dominated type of inertial gravity wave in any case. Yet one would be challenged to find a graphic of a Rossby wave that resembled these megaripples in any way, shape or form. I am familiar with popular representations (including the Wikipedia page) of Rossby waves that appear to define them as the fluctuating curving boundaries of the Polar Vortex which is largely aligned with the North American Jet Stream. you lost me there already. my thinking is that the water vapor is condensing on dust particles especially iron that would be or could be a bit magnetic. I have not studied it, but it could be that the patterns are due earth’s magnetic field/////////////////////? Coriolus? That’s a play by Shakespeare, innit? I would be worried that this is merely an artifact of the averaging procedure. Weather doesn’t occur in ‘beats’ like these. We would have noticed them previously…..? If its bases on monthly averages, then its persistent but difficult to see without enough data points (so you don’t see it in small enough time frames). This reminds me of interference patterns of particles where its invisible at first but given enough time a pattern appears. I can’t imagine what atmospheric waves would be so stable in their patterns to produce interference patterns, but its an idea. Yes, I wonder if they can be seen in daily coverages for example myself. I like that. Author did some research and found something interesting. Don’t know what, if anything, it could mean. Tossed it out to the readers of WUWT for ideas and/or explanations. That will offer an avenue to enlightenment. “I don’t know what these … (fill in the blank) … are.” That is a rare expression in “climate science”. Keep digging and researching! You will find that WUWT University will be helpful. +1 .seriously refreshing approach ,sadly lacking in many areas today. Thanks, I never signed up for the other option that many of my former peers have adopted. Isn’t evaporation minus precip (EP) simply water vapor that has not condensed to clouds or rain? No ripples/waves here as I can see. Only in the global average… it could be either cloud storage of changes in water vapor content of the air (which is about 100x larger than cloud storage)…BUT..Most of the difference between evap and precip on anything smaller than global scales is explained by the horizontal transport of water vapor. Thanks, your image is from a single day and perhaps not integrated over a full atmosphere. The ERAI data featured in this post are monthly integrations over the full atmosphere. Also I do see ripples in your image over Kansas, they look like gravity waves. I’ve seen these ripples before, but where? AH! Dawned on me right after hitting Reply. This isn’t an artefact. We’re seeing wave-form ripples. I have the same problem so elegantly expressed by Nick Stokes. I have aphantasia so I really love stuff like this. What do you suppose was that wave coming from the North East? If the Earth shifted South-West ward, it could explain that errant wave. You are seeing the effects of lunar declinational tides in the atmosphere, if you choose the period of 27.32 days, instead of monthly. It will become much clearer what is going on, see web site linked in name, sorry the forecasts have run out as the retirement funds ran out. I’ve only read this quickly and I know nothing about this but diurnal wave patterns have been noted in atmospheric pressure measured by the good old barometer since Victorian times – ie there is a diurnal cycle at any one point on the surface. Is there any connection? Maybe? I posted a separate comment on a diurnal possibility. 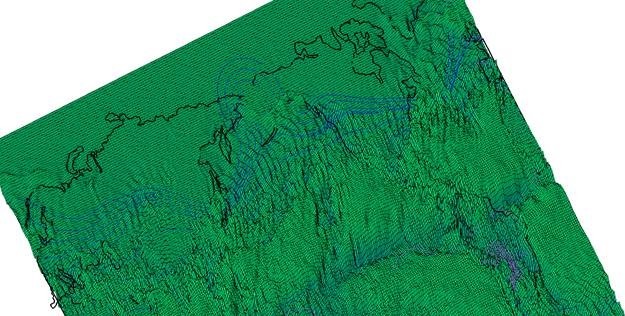 Perhaps we are seeing daily palimpsests of continental margins floating east across the barotropic parts of the middle latitudes? Consider the track of the sub-solar and sub-lunar points on the Earth’s surface during each ‘pass’ and their evolution over time. These show up as an activating wave function that is mostly evened out over a nearly 24 hour period. Nearly being the term that may be of interest. (I.e. waves in both gas and liquid). The unbalanced surface gravitational laterals to the sub-solar and sub-lunar at approximately 45% to the spherical surface in high latitudes may offer some clue. Especially as there are ocean ridges and choke points at those latitude in water and it is where the jet stream tends to reside in air. Thanks for all comments. Looks as if many find this interesting and puzzling, just as I do. These EP waves in my view are very likely real and don’t appear to fit aliasing patterns that I’m familiar with. Not to say there isn’t some aliasing going on as well. Moreover, even if real, the waves may only be curiosities. On the other hand, there may be forecasting applications which could result. To me they seem in a class of their own. They look a little like a hybrid of a dune form and a water wave form. Yet they would be a very slow motion water wave or a very fast evolving sand dune, ha ha. What is the source of the data? Possibly satellite-based, from speculating on the start date mentioned. You might be seeing an artifact of the sampling rate or method. Most ripples seem to be in mid-latitudes, so maybe there are weather patterns there rapid enough to leave traces along a satellite’s travel, but don’t tend to happen at poles or equator. Weather patterns are indeed different in those areas. Here is another screen capture. In this example, I selected December 2010 because of a reported atmospheric river dowsing Southern California. The host page includes a map of that river from an independent source to compare. If you come across any MJO surface plots to confirm like these that would be.interesting. To me the MJO seems to come with many conditions that don’t impact the waves seen here, including an equatorial focus. But I am no MJO expert. I might as well throw this in. It relates to a paper in progress but concerns the same EP parameter. This time I represented the average January and average July. The megaripples can be seen I think, even though the climatology covers a different profile. I made up some words at that site but that was only for fun and to draw attention to the observations which are real.